As you are aware, the National Treasury announced an increase in Value Added Tax (VAT) from 14% to 15% effective 1 April 2018. 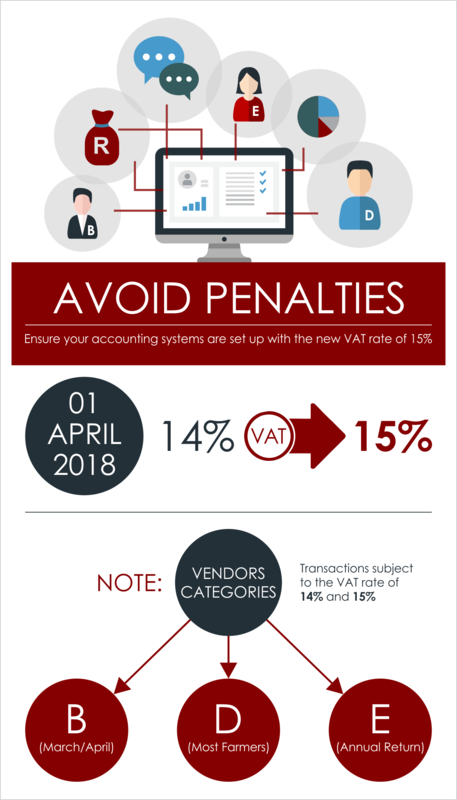 We urge you to ensure that your accounting systems are set up to process transactions at the new VAT rate of 15% from 1 April 2018. This is to avoid any penalties or interest due to an under declaration or an over claim on your VAT201return. Also note that vendors under Category B (March/April), Category E (annual return) and most farmers registered under Category D VAT reporting periods, will have transactions subject to the VAT rate of 14% and 15% which must be correctly reflected on the VAT201 return. Feel free to contact us should you have any questions or require assistance.